It’s not polite to stare, or so we’re told. Although you may not have heard of her, Ying Gao is one of the newest fashion designers capturing headlines with her intriguing clothes. Ying recently designed two dresses which contort and light up whenever it detects a fixed gaze. Ever wondered if that cute guy across the room is checking you out? Well now you’ll be able to tell, because your dress will move! 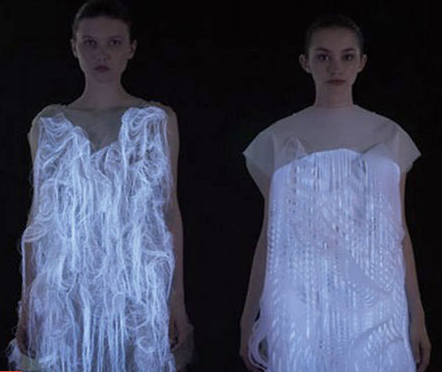 The dresses are embedded with eye-tracking technology that reacts to an observer’s gaze by activating tiny motors that move parts of the dress, creating captivating patterns. Oh, and they’re also glow-in-the-dark! Although they’re not available to purchase (yet) they are soon to be featured in the Shanghai Museum of Contemporary Art in November. Posted August 23rd, 2013 in Features. Tagged: fashion design, fashion designer, features, GMD loves, ying gao.